They’re two Scandinavian stars with huge followings back home and increasingly across Europe. And if the bookmakers have it right then Norway’s Alexander Rybak and Sweden’s Benjamin Ingrosso are also the front-runners to win Semi-Final 2 of Eurovision 2018. Norway, who is currently second favourite to win the grand final behind Cyprus, is the front-runner in this semi-final with odds as low as 5/4. Over the past two weeks, as other countries have faltered during their rehearsals, Norway has seen its fortunes rise. Its on-screen graphics, which will be familiar to fans of Melodi Grand Prix 2018, looks sharper and more expensive, and Alex’s charisma is squarely in tact. On top of his strong vocals and charming staging, Alex has another advantage: He’s well known among the Russian diaspora, having placed second on the Russian version of Your Face Sounds Familiar. Sweden’s Benjamin Ingrosso is currently down as second favourite with odds as low as 9/4. The “Dance You Off” singer, who will perform at the Wiwi Jam this evening, has transplanted his slick staging from Melodifestivalen to Lisbon. It remains polished and somehow vintage, transplanting viewers into an expensive music video. Moldova — one of the biggest growers of the year — is currently third favourite to win the semi-final, with odds as low as 6/1. Their infectious sound and inventive staging, which sees them running in and out of a series of doors, mixes pop, folk and slapstick to great effect. Ukraine, Australia, Latvia, the Netherlands, Denmark, Hungary and Russia round out the top 10 in terms of who will win this semi-final. For many countries, however, the main priority is making it to the Grand Final. That makes the odds to qualify perhaps more significant than the odds to win this semi. The bookies believe these 10 acts will qualify for the final: Norway, Sweden, Moldova, Ukraine, Australia, Poland, the Netherlands, Denmark, Hungary and Latvia. That means Russia, Romania, Malta, Serbia, Georgia, Montenegro, Slovenia and San Marino are out. The non-qualifiers currently include Russia and Romania. Neither of these countries has ever been eliminated from Eurovision during the semi-finals. Proud of my Country well done Serbia! We have one of the best vocalists in this competition. We just nailed it! Jako smo ponosni na vas i samo dalje nije bitan plazman bitno je da se pokazemo a bgm mocni smo!! I have a single satisfaction: we can now say SHUT UP to all pathetic people that said that Romania is qualifying just with diaspora. It was just proven that we were contenders so many years, diaspora didn’t qualify us. Some will be very happy, as I said, I’ve seen here some pathetic people in the past. I’m afraid Poland and Netherlands could not reach the final. I start to think that also Moldova could be out. Malta could reach it. Romania is qualifying in my opinion. Still not sure about Hungary, initially I said they won’t, now I’m not that sure. Russia is out, I’m almost sure. The way that fan was holding the Maltese flag it might as well have been the Polish flag upside down. It was probably a mistake by the director but I don’t think it’s THAT big a deal. After the live performances I say Poland is out and the Netherlands are in but it’s still very, very open. Slovenia, just pathetic! She tried at least! Moldova -New idea to use a wardrobe. In the end it’s boring and stupid 😛 but well sung. Netherlands -Potential has been lost. Australia -Unpleasant plesentation. But I like the song. I don’t like this exposed thighs… What for is that? Georgia -What should be a vocal performance, was… not. I waited for the harmonies. Barelly reached. Poland -Messy, but audience had fun at least. I would not show that much DJ. Malta -What a staging! Wow. Good job with that. Learn from that! Got my vote. Wow. Norway -It won’t be a fairytale at all. Boooring. Romania -What a positive surprise! Got my vote. Serbia -Staging looked well untill they turned it into red. The song is to weak for me, though I like balkan rhythms. San Marino -I hear Mans’s “Heroes” in the chorus. No comment. Denmark -Wow! First goosebumps on this ESC. I’ll Vote! Although the snow was better done by Loreen. It could be amazing if that one would be used here. m I the only one thinking Sweden and Slovenia are in the same category songwise? They just have a similar feel to it, so there may not be room for both songs in the final. If it comes down to personality I think Lea Sirk is more likeable but I think Ingrosso has more fans (if he hasn’t scared them off with bad behaviour). But I really hope there will be room for both because I want to see Slovenia go through. On my scoring system which I have developed over many years, LATVIA and ROMANIA had exactly the same score I could not split them. RUSSIA, MALTA and SLOVENIA were all very very close too. SWEDEN came out on top. Norway, Romania, Denmark, Russia, Moldova , Australia, Poland, Latvia, Sweden, Ukraine. Something tells me that Netherlands will not qualify, even though I totally want it in the final, but from what I’ve seen he will have a quite strange show. Also I am not sure at all about Moldova, if I wold bet right now, Hungary and Moldova have very high odds in not qualifying and I don’t see Hungary qualifying at all to be sincere. On my opinion, Netherlands have more chance than Hungary, but sometimes I think that They countries will be not qualifying, cause music style is so hard. Maybe Romania or Malta have pretty chance. Why is Moldova a sure qualifier to so many people? The song isn’t great and the juries won’t like it. I mean, they most likely will qualify but at 8-10 place. The performance isn’t anything special either, they’re cute but that’s it… It didn’t even do very well in the press poll yesterday. I can only see Eastern Europe giving it a lot of points. I’m not going to say Norway will win. But I also won’t say they won’t win. They have a pretty big chance to become the second performer to win twice. That’s all. Not Sweden and not Norway. Denmark has just appeared my favourite tonight. I think Montenegro and Georgia (especially Georgia) may surprise us and qualify. Russia has chances to qualify as well, considering how weak this semi final is. And I would like to see Romanus instead of Poland in grand final. In general, it’s a pity that we will miss a lot of great songs from semi 1 in grand final…instead, we will have less deserving songs from semi 2 in grand final. Only Norway, Sweden., and a bit Australia, Netherlands, Ukraine are deserving acts for the grand final. Isnt strange that Norway sweden and Denmark compete on the 2nd semifinal? Was IT PREARANGED TO MAKE THEM CUALIFY?………………. I wish you would abandon old-fashioned odds, and replaces them with decimal odds. Australia was absolutely terrible in the jury show but NEVER underestime the juries and their bias towards Australia. They WILL put her top 2 tonight (they’re required to) and save her. EBU can’t have their darling Australia not qualify because money talks 🙂 And don’t be surprised if the juries put her in top 3 this saturday. Since my gut feeling worked so well in the last semi, I’ll try it again for this one. It’s surprisingly hard. I say Denmark, Hungary, Sweden and Ukraine are safe. Slovenia and Montenegro will also get through. Georgia and probably Australia will be saved by the juries. The last two spots will go to Moldova and Norway. But neither of them will win the contest. I’m now writing on the OGAE UK (FB) site and I have an OGAE UK (FB) POLL on who will win Semi 2 and who will be the 10 qualifiers tonight. Who’s pushing Norway so blatantly ? Oh, wait …..
ALFRED Y AMAIA MEET AND GREET TODAY 17.00 EUROVILLAGE. wiwiblogs Howmuch did you make kirkorov . MOLDOVA realy bad song? Is gonna be a post about Spotify results? 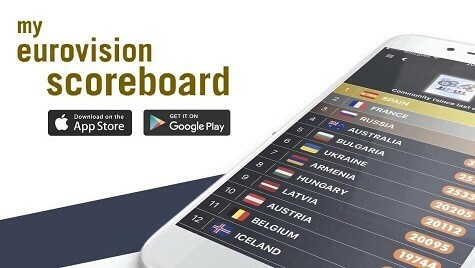 Czech Republic is winning at the moment followed by Israel and Cyprus. Men have dominated the world for so long! That 4 women are hosting the Eurovision isn’t a big deal, it’s time that women and non men take some place in this world! Yes. You can go to the war and not us. You can also clean the streets, drive trucks, build buildings, be an active police (not in offices),… In my country the 90% of deads in workplaces are men. Why the most dangerous works are made by us? It’s your time. If Denmark 2016 didn’t qualify I would be shocked to see Poland qualfy. How are they even similar? I’d say that sure qualifiers are Norway, Sweden, Ukraine and, unfortunately, Moldova. Then I think that probable qualifiers are Australia, Poland, Hungary, Denmark and the Netherlands. It means that there is one spot left for any of the rest of the countries. Slovenia, maybe? Malta? Netherlands will 100% qualify, Latvia will stay in the semi for sure. Thats uncertain if Latvia qualifies or not. You cant be sure. Nobody knows. It is 50/50 chances. I HOPE the Netherlands will qualify because, again, this is my favourite studio track in the second semi final. However, I have serious doubts if he will make it. Maybe I’ll change my mind after the live performance. If Russia qualifies its only because of the disapora voting. Sweden will win this semi. His song is so good! I think Montenegro will qualify instead of Latvia. Ari from Iceland also seems to be a sweet soul with a positive message, yet he hasn’t qualified. It is a song contest and points should not be awarded for personality traits. Well if we considered personality traits last year we wouldn’t now have a reigning champion (Salvador) spouting hate towards other genres of music that aren’t like his own. Do we really want that again this year? The artist and the message of their song should definitely be considered. Yet, should we overlook bad staging and very shaky vocals solely due to her personality and the message behind the song? I’m predicting Russia will not qualify this year. Her story might not be enough to compensate for the lack of musicality. Russia and Romania will follow Azerbaijan.. I think Slovenia will quality, it’s a dark horse for sure. I don’t predict Ukraine either – tryhard ~dark~ performances like that rarely do well. Poland, Sweden, Slovenia- good dance tracks.